My 80 km long canal links the Pacific and Atlantic Oceans via the isthmus of Panama, the narrow strip of land that links Central America with South America. I’m called the Panama Canal and I’m proud to be the faster route between the two oceans for transporting goods, ahead of Cape Horn far away at the southern tip of South America. Every year, I am crossed by 15,000 ships and my activity generates more than a billion dollars in turnover. 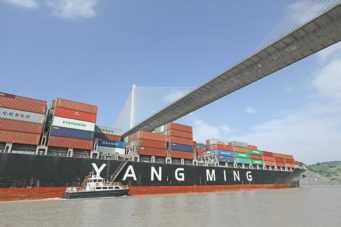 I’m without doubt a strategic hub for world maritime trade and to further strengthen my influence, a development plan has been launched for the period 2007-2025 so I can receive ever larger ships and maintain my attractiveness in comparison to the other maritime routes. My new locks designed to allow Post-Panamax gauge ships to pass were inaugurated in 2016. Human beings first conceived the possibility of my existence in 1880. It resulted in a gigantic excavation project entrusted to Ferdinand de Lesseps, a French businessman who had already built the Suez Canal. Nearly 25,000 workers died of malaria and yellow fever at the beginning of my construction. It was a genuine disaster for a very (over-) costly project. 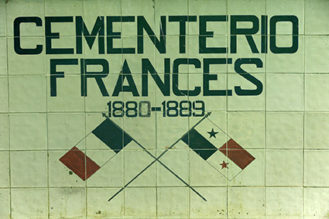 In addition, it was a financial scandal that led to the bankruptcy of de Lessep’s company, the Compagnie Universelle du Canal Interocéanique du Panama. After that, American engineers set to work at the beginning of the 20th century and I was finally completed in 1914. Nearly 30,000 French and American workers perished on my site before I was inaugurated. I wasn’t retroceded to Panama until many years later, in 1999, by the Torijos-Carter treaties, and my management was entrusted to a public organisation, the Panama Canal Authority (ACP). Merchant shipping: Americans love me! 22,000 kilometres separate San Francisco from New-York when passing via Cape Horn. But when passing via my canal, ship owners reduce the journey of their vessels to 9,000 km, a real saving in time! That’s why the United States very quickly considered me to be a strategic infrastructure and made me one of their sovereign territories for decades. This geographic situation allows me to attract 5% of the world’s merchant shipping (excluding oil) and makes me one of Panama’s main economic resources, after banking. The Americans are not my owners, but I remain crucial since the United States uses me to export its goods like cereals, and to import minerals and oil products. I’m an unavoidable route for many links with their Asian clients on the other side of the Pacific, and with Latin America. Although they handed me over to Panama in 1999, the Americans did not forget to obtain priority for the passage of their ships. Japan and China are my other main users. The Gatun dam, which has permitted creating the lake with the same name, was built just before me and produces hydroelectricity intended in particular to operate my locks and other equipment. It also provides the energy needed to light the surrounding towns. My geographical situation makes me a choice location for cruise liners from all over the world, especially between Alaska and the Caribbean. I also attract hikers and the curious to discover the land around me, to see these splendid landscapes of Central America with its wealth of fauna and flora. Alone, I attract 1 million tourists, including a large number who pass through me on cruise liners (more than 300 a year). 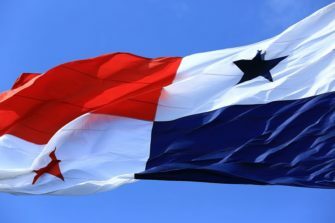 Panama has become politically more stable, and it is generally spared by hurricanes and earthquakes, leading to an influx of tourists and pensioners. Although people come to visit me from all over the world, the great majority of them are Americans, since they are so close! The airport is one of the busiest in Latin America and property developments are mushrooming in the Gulf of Panama. My locks were too small and the depth of my canals too shallow for the new and increasingly numerous giant Post Panamax ships, most of which are super oil tankers and container ships. The solution was to widen my access routes by building two new series of locks, one to the east of those of Gatun and one southwest of the locks of Miraflores. My bed also had to be deepened. This gigantic project lasted from 2007 to 2016 and cost $5 billion. increase my financial contribution to the Panamanian public coffers. Inaugurated in 2016, these new locks have stimulated container traffic. What’s more they showcase the excellence of French engineering! CNR was responsible for the design and physical and numerical modelling of the new locks before their construction. 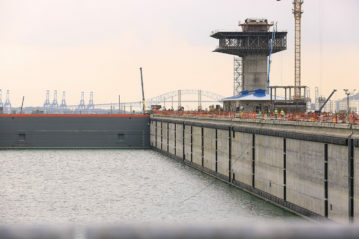 Its work led to certain innovations: despite chambers double the size of the old ones, the new locks consume 8% of the water and they are filled in less than 10 minutes. By enlarging its canal, Panama can take advantage of growing trade between Latin America and Asia. 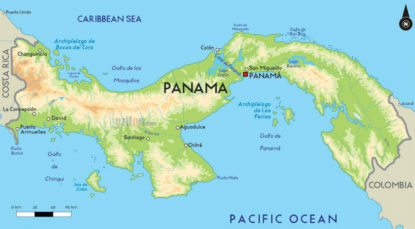 In addition to the canal, Panama has six ports, a railway line, an expressway and Colon, on the Caribbean Sea, is the largest free trade zone in the world after Hong-Kong. Enlarging the canal should permit reaching $1 million in passage fees per boat, versus $350,000 today. This enlargement also gives the United States the opportunity to export oil products from the Gulf of Mexico to Asia. 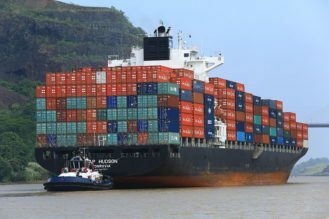 A large number of ports on the American coast are already seeking to adapt to the post-Panamax gauge, especially those of Charleston in South Carolina, New York and New Jersey. The number of ships on the seas is increasing and the need for water too. Every passage through a lock requires 166 million litres of water that come for the most part from Lakes Gatun and Madden! This creates a problem since these same lakes supply water to the populations of Panama City and Colon. The problems of water shortages in the canal are having an impact already, notably following the low rainfall levels during the El Nino episodes (warm current from the Pacific), in 1983 and 1998. The country must also repair the damage caused by years of deforestation in the watershed, which leads to silting up the canal. Hello, I invite you to visit the following page, on the Initiatives for the Future of Great Rivers (IFGR) website :Panama Canal https://www.initiativesrivers.org/rivers/panama-canal/ Best regards. Votre email semble vide ou incorrect.